Don’t worry, these restaurants are all cheese-free zones (well, apart from the post-dinner cheese boards…) so you can expect sumptuous food, excellent service and a charming atmosphere without any of the Valentine’s Day cringe. For an unforgettable Valentine’s Day, why not head to Skye for a weekend away? The rugged landscape and secluded setting makes this island one of the most romantic spots in Scotland, and there’s no better place to stop off for dinner than the Three Chimneys. This iconic restaurant with rooms uses the finest produce from the local area to create truly special dishes, and the luxurious yet welcoming atmosphere makes it the perfect romantic retreat for couples who want to enjoy good food in a relaxed setting. Tucked away in Edinburgh’s New Town, this award-winning hidden gem is a favourite with locals because of the exceptional food and warm service. New Chapter is wonderfully intimate at the best of times, but this Valentine’s Day they’re making things extra-special with the launch of their jazz nights series. With Robert Pettigrew on piano and Kenny Ellis on bass, diners can enjoy delectable dishes from the contemporary a la carte menu while listening to mellow tunes from the talented jazz duo. If you miss out on Valentine’s Day, don’t worry - the jazz nights will be taking place every Wednesday so you can sweep your other half off their feet. If food is the way to a man’s (or woman’s) heart, then Porter & Rye is the place to go to impress your new beau. This stylish New York-inspired restaurant specialises in top-quality steak which is dry-aged to enhance the flavour. Locally sourced from Gaindykehead Farm of Airdrie, the steaks are some of the best we’ve tasted. 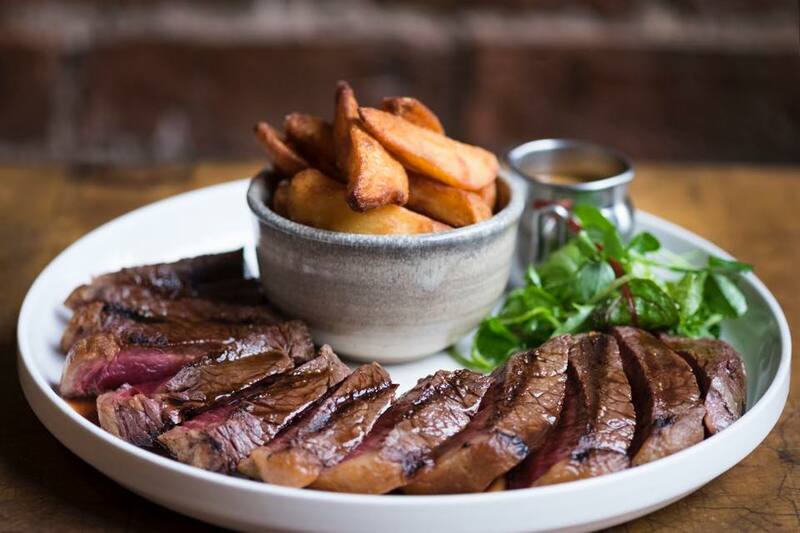 For a romantic dinner this Valentine’s Day, opt for a sharing cut and plenty of sides to enjoy with your date - we’d recommend the Chateaubriand with bearnaise sauce, bone marrow mac and cheese, and beef dripping chips with rosemary salt. Set in the picturesque Invernesshire countryside, Boath House is a luxury country house restaurant with rooms, offering a sophisticated take on Highland hospitality. The five-star restaurant is the perfect place to treat your other half to some fine cuisine, with a menu packed full of locally source produce. Wine and dine someone special this Valentine’s Day at the Boath House restaurant, and don’t forget to book yourself one of the beautiful rooms upstairs for a romantic getaway which can last the whole weekend. One of Glasgow’s most romantic restaurants, the Ubiquitous Chip is as well known for its interiors as it is for its food. The stunning, leafy greenhouse-esque space is decked out with twinkling fairy lights and flickering candles, giving it a cosy, quaint and oh-so-romantic atmosphere. Your date won’t be disappointed with the food here, either. The menu has a firm focus on Scottish produce, and traditional dishes have been given a contemporary twist to keep them fresh and interesting - all presented beautifully, of course. If you’re looking for great food without the formal atmosphere of a fine dining restaurant, head to Aberdeen’s Moonfish Cafe this Valentine’s Day. The innovative, ever-changing menu features local produce alongside influences from across the world. The interiors are stylish but pared-back, offering an intimate dining experience that’s both romantic and relaxed at the same time. Alongside delicious, contemporary dishes, you and your date can share a bottle of organic or biodynamic wine from Moonfish’s carefully curated wine list. With a menu influenced by French cuisine, and making use of Scotland’s natural larder, Cail Bruich is the perfect spot for a romantic Valentine’s Day dinner in Glasgow. For an extra-special meal, opt for the land and sea tasting menu with a selection of some of the restaurant’s best seasonal dishes. Cail Bruich also offer a range of drinks pairings to go along with the tasting menu - choose from an alcoholic or non-alcoholic version, or opt for the wine and fizz pairing if you’re going all-out. Paul Tamburrini at Macdonald Holyrood Hotel is a fine dining destination well worth visiting this Valentine’s Day. With dark, luxurious interiors and some of the best gourmet cuisine in Edinburgh, this restaurant is just about as romantic as they get. The sumptuous menu has been heavily inspired by French techniques, with plenty of rich, decadent dishes to impress your other half. Make sure to start with a champagne cocktail at the bar to get your meal off to the right start.